This guide to investing in the bioenergy market covers the topic from both a scientific, economic and political perspective. It describes the increasing number of second generation biodiesel projects which are now emerging in anticipation of growing sustainability concerns by governments, and in response to market demands for improved process efficiencies and greater feedstock production yields. 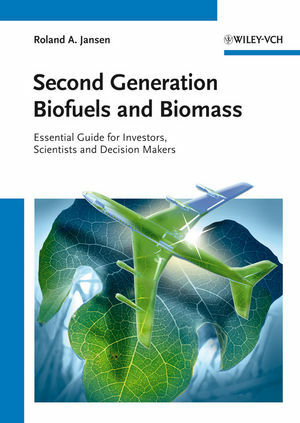 The book also closely examines the science and technology involved in second generation biofuels and gives concrete examples, such as in the aviation industry. The result is an essential guide for scientists, investors, politicians and decision-makers in the energy sector. Roland A. Jansen, from The Netherlands, holds a degree in Business Administration (lic.oec.HSG) from the University of St. Gallen, Switzerland. Mr. Jansen is CEO of Mother Earth Investments AG (Switzerland) and Biomass Partners Ltd. in Hong Kong. Mother Earth Investments AG manages assets in natural resources for banks, private clients, pension funds and family offices. He publishes his research bi-monthly in the Mother Earth Commodity Analysis Report. Biomass Partners in Hong Kong Ltd. trades second generation biofuels and biomass on behalf of mines, powerplants and refineries. He is the author of ?Profits from Natural Resources?, John Wiley & Sons, New York, (1998). Mr Jansen has appeared regularly on Bloomberg Television to give his views on commodity trends. He is also a regular guest speaker at conferences and universities around the world and serves as a honorary consul for The Netherlands in Liechtenstein. First-Generation Feedstock: What Speaks against Biofuels of the First Generation? Why Is Biomass in High Demand? What is Driving the Urgency in Renewable Jet Fuel? Watch a video with Roland Jansen, in which he discusses the outlook for second-generation biofuels. He talks with Andrea Catherwood on Bloomberg Television's Last Word.